Developed as a direct result of our own experiences in vacation rental management, the Homes and Rooms Inquiry Manager provides you with a suite of online tools with the express purpose of maximizing your reservations while minimizing the amount of time needed to respond to them. In busy periods particularly, you can find yourself tied to the phone or the computer, dealing with prospective guest inquiries. But not anymore! Our automated Inquiry Manager makes light work of responding to each and every inquiry and it does so in real-time 24/7. Our Auto Responder allows you to choose the level of automated response while still retaining a surprising degree of personalization in your communications with guests and inquirers. We can help you make light work too of rates and tax calculations with our flexible and easy to manage Rates Builder. Again, you are in control and make the important decisions while this sophisticated tool does the hard work. The third tool in our Inquiry Manager toolbox, Option Builder, enables you to modify our services to suit the needs of your individual property. We recognize that every rental is unique, so our services offer a high degree of customization to suit the varied needs of our subscribers. 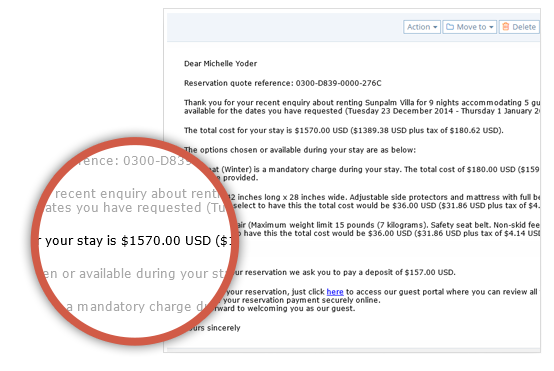 Personalized yet automated instant responses to all email inquiries helping you increase your confirmed reservations. A rapid response to guest inquiries will boost reservations. Yet responding to reservation inquiries can be a real chore for independent owners, particularly when it comes to potential guests you know you can't accommodate. Imagine then, if you could deliver an automatic response to any inquiry email – one based on your own design – and provide an instant quote the moment the guest requested it? With Homes and Rooms you can! Not only do we save you valuable time, but we also ensure that you are among the first to respond to inquiries without lifting a finger. With our system, it even appears as though you typed the response personally for each and every guest! Another great timesaving tool is the ability to hold back for review an auto-reply to a prospective guest that has asked you a question. You can filter incoming inquiries by any keywords you choose such as 'military discount' or 'pets'. We can provide any level of automation that you require, empowering you to respond quickly and effectively to guest inquiries using any internet enabled device, whether it's your computer, tablet or smartphone. You can be alerted by email or SMS about inquiries as they come in and, if you prefer, can choose to respond to each one manually. Or you can simply let the Auto-Responder handle it. Simplify the creation of complex rates, charges and taxes to maximize your revenues. Rates and tax calculations can be a complex minefield for the busy owner or manager. Why struggle when we can take care of it for you? Thanks to our unique Homes and Rooms Rates Builder the process of creating rates, charges and taxes is made simple. It provides you with the flexibility to apply these rates to your property, its features and any extras. Simply choose the rates, how you allocate them – even what you call them. Each property you manage using Rate Builder can have different rates and taxes applied to it and you can choose to apply alternative rates depending on the season, or at the time of the request relative to the time of stay. You can apply special and holiday rates – or even allow options for arrival and departure days. The result is that guests receive a dynamic, instantly calculated quote that is specific to their request. At the same time, you maximize your revenues. We'll also provide you with a charge breakdown report to record what you have charged and what you will have to pay in tax, where applicable. Enables you as the owner or manager to customize our solution to your style of property management. One size does not fit all. In fact, experience has shown us that customization requirements can vary greatly depending on the owner, so we developed our own imaginative solution — the personalized Option Builder. This allows you as the owner or manager to customize our solution to meet your specific needs in managing your property. Many of our service features can be modified to suit you. 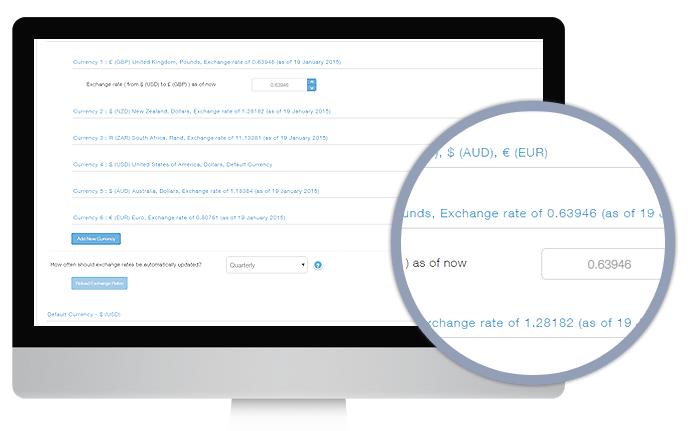 For example, if you have complex deposit rules dependent upon a number of variables, our easy-to-use Rules Builder wizard will walk you through the customization process. As an example, say you specify a deposit of 20% of the total cost payable for stays longer than 5 days that are booked more than 6 weeks in advance. At the same time, you wish to ask for payment in full for fixed price weekend specials booked a month ahead. Our system copes easily with this situation and will reflect it to prospective guests automatically with an accurate and detailed instant quote. Your property is unique and has its own features and extras that you will want to tell guests about or, perhaps, use as a means of generating extra income. We provide versatile tools to create and promote personalized features and extras for each property. You can choose to promote these as non-chargeable or chargeable – and whether they are shown with or without tax. 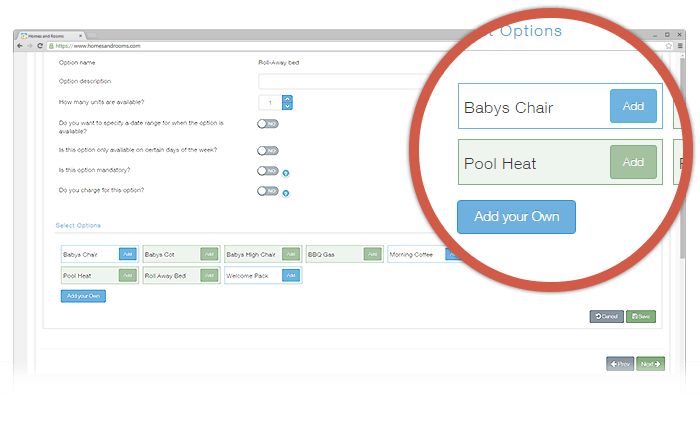 You can even create seasonal charging rates and rules for individual features such as pool heating that may vary depending on the season and on whether or not it is requested by guests. 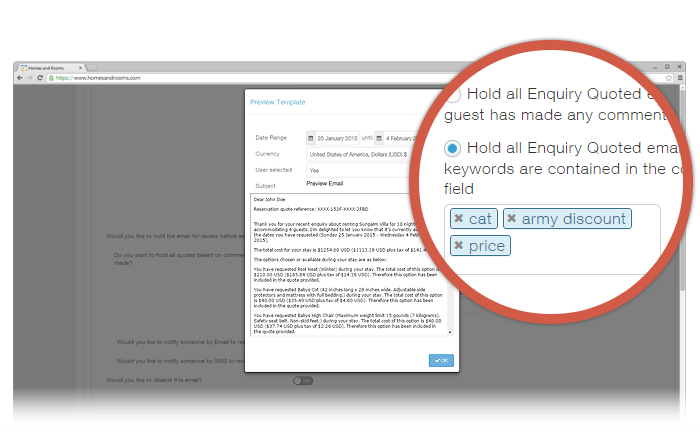 Extras such as a welcome pack, use of car, an extra bed and much more can each be optionally shown on the guest booking form plug-in. Any and all of your chargeable and complementary property options can be incorporated into the automated quotes sent to your prospective guest. Our responsive system can be extended to cope with even the most unusual requirements. And, if you have a particular rule or a certain way in which you want to run the management of your property and our system doesn't currently support it, just let us know and we’ll gladly incorporate it.